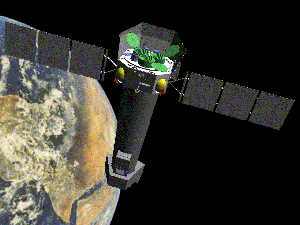 IMAGE - An artist's impression of the XMM Satellite in orbit over Africa. Why do X-ray observatories have to orbit the Earth? The Earth's atmosphere absorbs radiation at all wavelengths below that of visible light. X-rays have a shorter wavelength than visible light and so any telescope designed to detect them must be in orbit above the atmosphere. The launch of XMM aboard an Arianne 5 Rocket, a product of Ariannespace and the European Space Agency, on 10th December, 1999. What type of orbit is XMM in? XMM is in an eccentric 48 hour orbit around the Earth, at an inclination of 40 degrees to the Equator. What is the Perigee and Apogee of XMM's orbit? The perigee of an orbit is the distance of closest approach to the Earth, whilst the apogee is the greatest distance from it. The Perigee of XMM's orbit is 7,000 km and the Apogee is 114,000 km, measured in each case from the surface. For how much of its orbit will XMM be operational? XMM spends 8 hours of its orbit in the Van Allen Radiation Belt, which extends to an altitude of 40,000 km above the surface of the Earth. The interference from this radiation belt prevents XMM from collecting data and restricts its operational time to 40 hours per orbit. The radiation belts consist of high energy electrons and protons which are trapped in the earths magnetic field. These particles affect the operation of XMM's electronics and detectors.